Christmas in Bogotá: Closer to the stars, lights and acrobatic action. 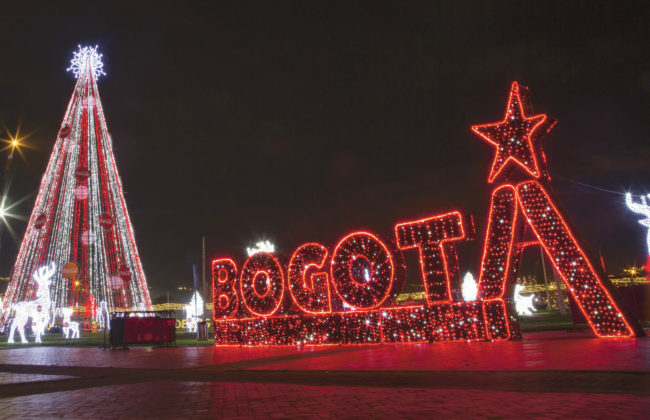 Christmas officially began in Bogotá with the illumination of parks and public spaces on December 2, including the lighting of the city’s tallest tree of 50 meters in Parque Tunal. The spectacular lights that are decorating main avenues, buildings and famous landmarks have also reached closer to the stars with the shrine of the Fallen Christ on top of Monserrate. Looming over the capital with an elevation of 3,152 meters a.s.l, Monserrate is a kaleidoscope of colors, and so too, the cable that suspends the gondolas. As December’s largest under-the-sky attraction invites locals to explore parts of the city they may not ordinarily visit, as well as a draw for tourists from around the world, Bogotá’s lights announce a month-long cultural agenda that includes free concerts, Novenas and a night bicycle ride along the city’s many designated bike paths. The first major activity the Mayoralty has organized is the candle lighting on Noche de Velitas, which takes place on Friday, December 7, in the Plaza de Bolívar. This family event with thousands of candles sparkling in Bogotá’s most important square will be accompanied by a Christmas Concert performed by the Grammy Award-winning Bogotá Philharmonic Orchestra (OFB), the Youth Choir of the OFB and Choral Society Santa Cecilia. The concert, conducted by Josep Caballe-Domenech, ends with a grand fireworks display. Several blocks from Plaza de Bolívar, in the locality of Los Martíres, the Bronx Creative District will also celebrate Noche de Velitas with a fashion show, street performance by stilt walkers, opera and two interactive light installations. Bronx Distrito Creativo was established a year ago as the first creative district in the country. Festival Bronx Distrito Creativo is sponsored by the Mayoralty and Gilberto Alzate Avendaño Foundation. It looks to recognize up-and-coming artists who are transforming this once derelict neighborhood into a vibrant cultural hub at the heart of the city. The event begins at 4:00 pm with the catwalk (“El Desfiladero”), where innovative designs from five winners of the Creación Bronx grants will be shown to the public. One of the city’s most anticipated events this Christmas is Ciclovía Nocturna (Night Bike Ride), on Thursday, December 13, starting 6:00 pm to midnight. With 500 kilometers of bike lanes, and streets of the Sunday Ciclovía set aside for cyclists and pedestrians, the event this year includes live music in seven parks (La Valvanera, Nacional, Renacimiento, El Virrey, Córdoba, Cedritos and El Sol) so that participants can take a break from the pedaling and wander among the lights. At several key locations, the district will set-off the fireworks. Studio Festi is an Italian production company that stages breathtaking installations in urban and natural settings, by projecting visuals on well-known landmarks. Created exclusively for Bogotá, during 8 days (Dec 16 – 23) and with three performances each day (7:00 pm, 8:15 pm, 9:30 pm) the Plaza de Bolívar will host Studio Festi’s Christmas gift to the city: Más cerca de la estrellas. Director Valerio Festi and playwright Monica Maimone of Más cerca de la estrellas (Closer to the stars) take audiences on a visual journey of the history of Bogotá. From the city’s pre-Columbian heritage, at the heart of the legendary El Dorado, to the Spanish conquest of New Granada and founding the city by a small Andean settlement led by Gonzalo Jiménez de Quesada. As the Plaza de Bolívar resounds to the words of those who have made history with three giant tableaux serving as the backdrop for aerial acrobats, Más cerca de la estrellas is an art-experience suitable for all ages, and rare opportunity to be part of history-in-making, as Studio Festi has performed in over 400 cities during 20 years, and this month, marks its Bogotá debut. 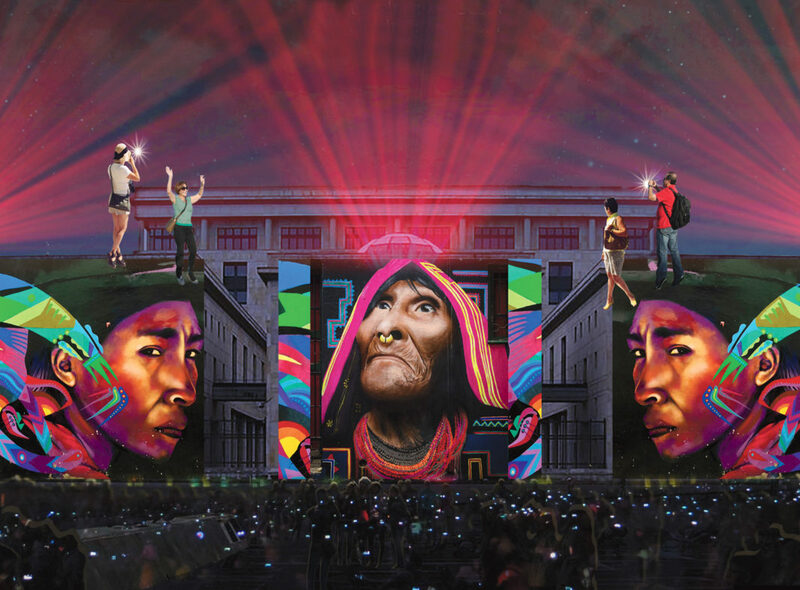 Taking on the diversity of the past, from the Muisca to our colonial roots, this one hour show catapults audiences towards the future, and gives them the chance to envision Bogotá a century, or two, from today. As a free event for all ages, and one that fills the square during the busy holiday season, the district has facilitated special access points to the Plaza on Calle 11 with Cra 9; Cra 8 with Calle 12; Cra 7 with Calle 12 and Calle 11 with Cra 6. The exits are at the northwest and southwest corners of the square, and given the large turn-out of spectators, the Plaza will have two health stations and a designated area for persons with disabilities. On the same evening Italy raises the curtain on Bogotá, Novenas will be held in eight localities, a celebration that brings family and friends together until Christmas Eve. Every day during this time of the year, starting at sundown and surrounded by sparkling lights, traditional carol singing set the tone in parks and commercial centers for the Novenas, a very festive way of enjoying the holiday season, and feeling part of Bogotá, a city that has earned its place among the stars. Next articleColombia’s largest arts and crafts fair Expoartesanías opens with new look for ancient trades.